For three minutes, the most frightened people in the world may have been the crew and passengers aboard US Airways Flight 1549 as the plane headed for a splashdown in the Hudson River. Sullenberger, who was hailed as a hero for successfully landing the flight, also testified Tuesday before a House subcommittee, telling lawmakers the state of the airline industry is in disarray. “Americans have experienced huge economic difficulties in recent months, but airline employees have been experiencing those challenges and more for eight years,” Sullenberger said. “We’ve been hit by an economic tsunami, September 11, bankruptcies, fluctuating fuel prices, mergers, loss of pensions and revolving door management teams who have used airline employees as an ATM.” Sullenberger expressed concern the economic decline has hit the airline industry so hard that “the airline piloting profession will not be able to continue to attract the best and the brightest.” “I do not know a single professional airline pilot who wants his or her children to follow in their footsteps,” he said. Last month’s emergency occurred about three hours into controller Harten’s eight-hour shift, but only 15 minutes after he was assigned to handle departures from New York’s LaGuardia Airport. Harten said he instructed Flight 1549 — which used the call sign Cactus 1549 — to climb to 15,000 feet, then turned his attention to another aircraft. When he turned back to 1549 to instruct it to turn west, Sullenberger advised him he had lost power in both engines because of a bird strike and needed to return to LaGuardia for an emergency landing. “While I have worked 10 or 12 emergencies over the course of my career, I have never worked an aircraft with zero thrust capabilities,” Harten’s testimony says. “I understood how grave this situation was.” Harten says he “made a split-second decision” to offer Sullenberger Runway 13, the closest runway, and contacted LaGuardia tower to clear the runways for an emergency. When Sullenberger radioed, “We’re unable,” he directed the plane to Runway 31. Sullenberger again said, “Unable.” Sullenberger suggested Teterboro Airport in New Jersey, Harten said. Harten said that after coordinating with controllers in Teterboro, they determined that Runway 1 was the best option and cleared it for an emergency landing. But Sullenberger said, “We can’t do it,” adding, “We’re going to be in the Hudson.” “I asked him to repeat himself, even though I heard him just fine. I simply could not wrap my mind around those words,” Harten said. “People don’t survive landings on the Hudson River; I thought it was his own death sentence. I believed at that moment, I was going to be the last person to talk to anyone on that plane alive.” Harten said he lost radio contact with Flight 1549 and the plane disappeared from his radar screen as it dropped below New York’s skyscrapers. View photos from the dramatic landing » “I was in shock. I was sure the plane had gone down,” he said. But 1549 flickered back onto his radar screen, suggesting the plane had regained use of one of its engines. Harten told the pilot he could land at Newark, seven miles away, but he got no response. “I then lost radar contact again, this time for good.” Soon thereafter, Harten was relieved of his radar position, a routine move following a major incident. “I was in no position to continue to work air traffic. It was the lowest low I had ever felt. I wanted to talk to my wife. But I knew if I tried to speak or even heard her voice, I would fall apart completely.” Instead, he sent her a text message: “Had a crash. Not OK. Can’t talk now.” His wife thought he had been in a car accident. “Truth was, I felt like I’d been hit by a bus,” he said. Harten said it was six hours before he could leave work after reviewing the tapes, filling out paperwork and making an official statement. 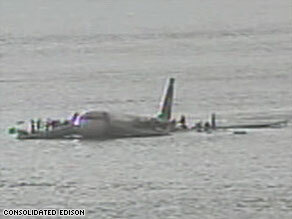 All five crew members and 150 passengers survived the crash.